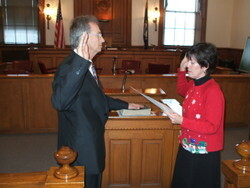 Roger Hayden was sworn in as the Dan River District, representative to the Patrick County Board of Supervisors on December 15, 2009 by Susan Gasperini, Clerk of the Court. He used the Bible of his mother, Peggy Hayden Tilley. He is a lifetime resident of the Dan River District in Patrick County, Virginia. Roger is a member of the Red Bank Ruritan Club in Claudville. He has most recently served as Chairman of the Broadband Task Force for Patrick County. He resides with his wife Mabel on Cox Ridge Road in the community of rural Claudville, VA. He has been instrumental in bringing in the new experimental technology, wireless broadband internet service, using the White Spaces, formally used for analog Television service. He just appeared on the front cover of Blue Ridge Business Journal, November 30, 2009 edition. The story of the use of “white spaces” was covered in an article, “WiFi on Steroids: Delivering Broadband To Rural Virginia”, in this magazine which is an insert to the Roanoke Times. Roger has been a proponent of bringing High Speed Internet service to an un-served section of rural Virginia. Roger attributes his successful election to Board of Supervisors, to door to door campaigning. His main objective has been to listen to the residents in rural Dan River District and determine what their needs are. ARARAT, Va. — Roger T. Hayden will be the new Dan River District representative on the Patrick County Board of Supervisors, according to Tuesday’s unofficial election results. Hayden, 62, of Claudville, captured the overall vote 515-354 over Janet R. Epperson, representing a margin of 59 to 41 percent. The two were vying to replace Jonathan Large, who opted not to seek another four-year term. “I’m very excited — I’m ready to go to work,” Hayden said Tuesday night after the results were tabulated. He took two of the three precincts in the Dan River District, and lost the third by only 10 votes. Hayden won the Willis Gap vote 162-93 and in his home precinct in Claudville by a 205 to 96 count. Epperson won in her home precinct, Ararat, by a margin of 147-137. Hayden credited his victory to hard work by those involved with his campaign. “The last five months has been pretty tough. I’ve worked really hard visiting people in the Dan River District, listening their concerns and the problems we face,” he said. “I appreciate the work that my campaign committee has done — they’ve worked very hard, especially during the past few days. I want to thank everybody.” Hayden also credited area media outlets and their coverage of the campaign. The election winner said his No. 1 priority when taking office at the first of the year will be trying to fulfill a campaign promise to “equalize” taxation in Patrick County. He explained that areas of the county with large farming tracts, such as the Dan River District, are taxed heavily as a result while receiving a disproportionate level of services in return. Hayden also has said that he would work to get more technology-oriented jobs in Patrick County. Epperson, 65, offered her congratulations to Hayden Tuesday night and applauded the way he conducted his campaign. She is hoping to see Hayden follow through on such goals as keeping property taxes low. And as the president of the Dan River Park Association, Epperson also would like his representation to lead to more county government support for parks and recreation in the district. Epperson said she would have had to give up her position with the park had she won the election, to avoid a conflict of interest. “Now I can go back to working on the park,” she said. Regardless of her loss, “I really have enjoyed this. It was a great opportunity for me to meet a lot of wonderful, wonderful people,” Epperson added. “I wish him the very best,” she said of Hayden. Also Tuesday, Patrick County voters rejected a proposal for a countywide meals tax. The unofficial vote was 2,909 to 1,804 against the proposal that would have added a 4-percent tax to meals served in restaurants as well as prepared foods sold in grocery stores, convenience stores and delicatessens. The tax would have applied to businesses in Ararat, Claudville and other areas of the county.